There is a call unto us to plant Christ-centered churches in urban centres and raise disciples to infiltrate the society with the life of Christ, the greatest antidote to the prevailing corruption and perverseness in our Nation. 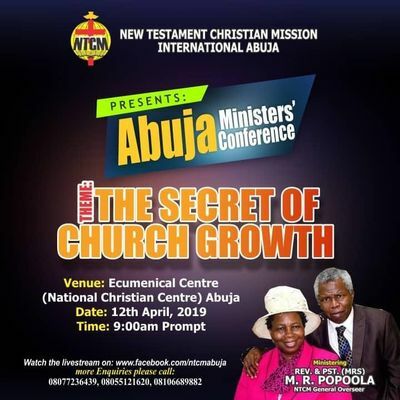 Come and learn how to raise resources that can be utilized to penetrate the countryside as well as cross cultures with the gospel of Christ by planting and growing gospel churches. Venue: Ecumenical Centre (National Christian Centre) Abuja. Participants will get Free Books and Light Refreshment.